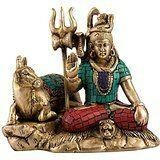 Beautiful Very Hand carved Solid metal brass on body of God Meditating Shiva And Nandi in sitting position. The Powerful God: About Hindu God shiva Shiva is 'shakti' or power, This Extremely Detailed and Well-Made statue is made with Heavy Quality Brass and colorful statue by hand, The special production process of this piece, originated from India Jaipur Brass Shiva sitting with Nandi (cow) Dimensions: Size : 6 Inches Height, Weight : 1 Kg, Material : Brass -------------- Pls beware from Copy product & ensure buying authentic product. This is exclusive product of Brand " Collectible India" and "covered by intellectual property rights laws". 'Collectible India' do not authorize any other Brand/Seller to sell it and won't be responsible if any copy or substandard product send by any other seller.